Posted on Monday, March 28th, 2011 at 7:00 am. Subscribe to the comments feed. Both comments and pings are currently closed. Post on your own blog. 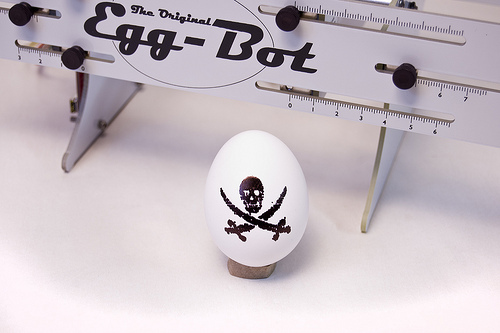 The Eggbot extension package for inkscape has a pretty awesome hatched fill, I think it would substantially decrease the amount of time it took to print this. You would need to do the vector trace in a different way though. Nice print! For something like the skull & crossbones, you could probably get away with the Trace Bitmap feature in Inkscape (very similar to “Live Trace” in Illustrator). It’s in the Path menu. Fiddling around with the options there should give you a really clean vector, then it is just a matter of selecting the connected chunks that you want to be drawn solid and running the Extensions > Eggbot Contributed > Hatch Fill command. I had great success with this method. I’ll keep playing with vectors, but I also want to do some cool stuff with stippling as well. Got any good SVG files you’ve used at DW? Crop Circles & Storm Trooper. The crop circles are hatched and ready to go, the storm trooper will work as is, I did it before I figured out about hatching so I just manually colored in the gun and a few shadows. There is an example pack on the website which has some good geometric stuff. I also did a 5 color logo using layers & multiple pens which was probably the most impressive of them all (see Layers tab on far right of eggbot control).